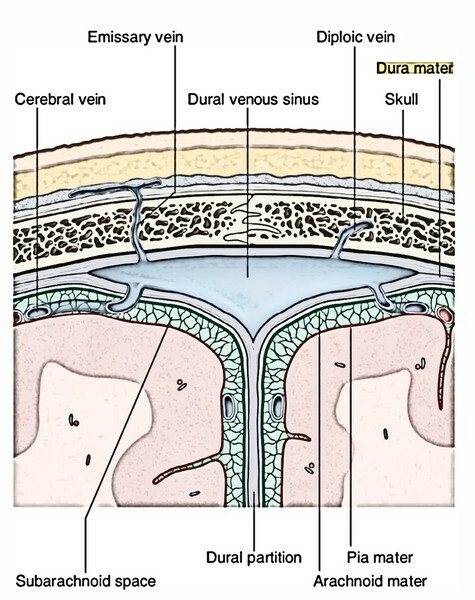 The cerebral dura mater (also termed cranial dura) is composed of 2 layers: outer bargain and inner meningeal layers and is a powerful fibrous membrane. With the exception of where they enclose venous sinuses, the 2 layers are fused with each other. Via sutures and the foramina of the skull, it’s continuous with the periosteum (pericranium) on the outer outermost layer of the skull. It’s also constant with the periosteal lining (periorbita) of the orbit via superior orbital fissure. It gives sheaths for cranial nerves, which fuse with epineurium. 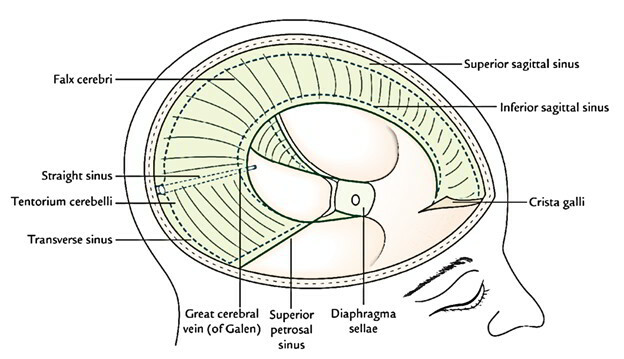 The dural sheath around the optic nerve fuses with the sclera of the eyeball. It’s loosely connected to the inner surface of the vault of the skull by numerous fibrous and vascular processes; nonetheless, it’s securely connected to the base of the skull along the sutures and around the margin of the foramen magnum. Consequently, it’s easily stripped from the vault of the skull but not from the base of the skull. Meningeal vessels go through this layer to supply the bone. The inner layer is actually the dura mater appropriate. It encloses the brain and at the foramen magnum becomes constant withthe dura mater encompassing the spinal cord (i.e., spinal dura). It’s divided from the arachnoid mater by a subdural space. At areas, the meningeal layer is folded on itself to create dural folds (also termed dural septa). The dural folds project into the cranial cavity and split it into compartments which lodge the distinct parts of the brain. It’s a large sickle shaped fold of the dura mater inhabiting the median longitudinal fissure between the 2 cerebral hemispheres. Its narrow anterior end is connected to the crista galli and the broad posterior end on to the upper surface of the tentorium cerebelli along the median plane. 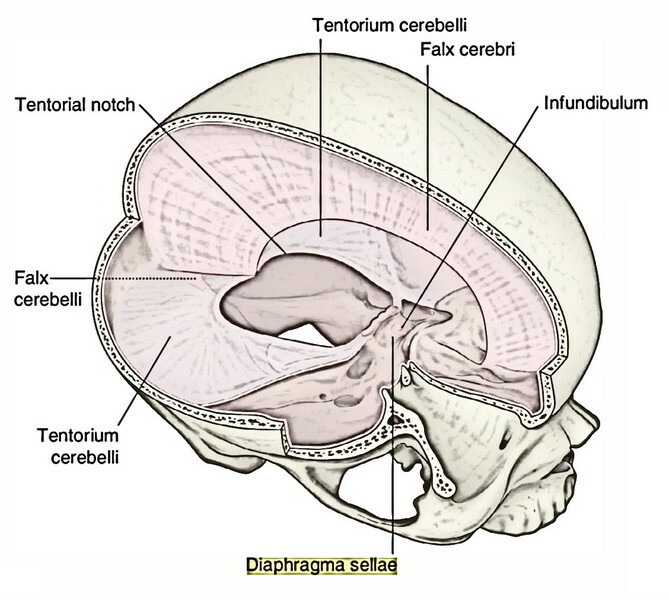 Its convex upper margin is connected to the lips of the sagittal sulcus of the skull vault and its lower concave margin is free and is located just above the corpus callosum. Superior sagittal sinus is enclosed inside the convex upper border. Inferior sagittal sinus is enclosed inside the lower con-cavern margin. Straight sinus is located along the line of connection of the falx cerebri with the tentorium cerebelli. It’s a tent-shaped fold of the dura mater creating the roof of the posterior cranial fossa. It divides the cerebellum from the occipital lobes of the cerebrum. It is 2 margins and 2 surfaces. The inner free margin is U shaped and encloses the tentorial notch (incisure) for the passage of the midbrain. The anterior ends of the concave free margin are connected to the anterior clinoid processes. The outer connected margin is convex and connected on every side (from before backward) to the posterior clinoid process, the posteroinferior angle of the parietal bone and the lips of transverse sulci on the occipital bone. The free and connected margins cross every other near the apex of the petrous temporal bone to enclose a triangular area anteriorly that is pierced by the oculomotor nerve. The convex upper surface slopes to either side from the median plane. In the median plane, it gives connection to falx cerebri. The concave inferior surface gives connection to falx cerebelli in its posterior part. 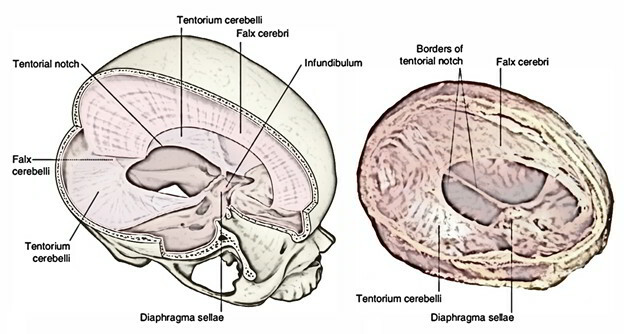 Trigeminal or Meckel’s cave: It’s a recess of the dura mater gift in regard to the connected outer margin of the tentorium cerebelli. It’s created by the evagination of the meningeal layer of the dura mater by 2 roots of the trigeminal nerve below thesuperior petrosal sinus over the trigeminal impression on the anterior surface of the petrous temporal bone near its apex. Transverse sinus, inside the posterior part of the connected margin. 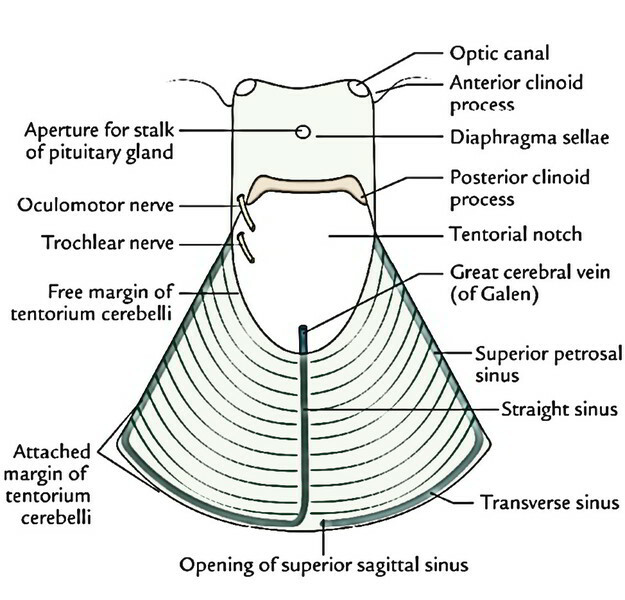 Superior petrosal sinus, inside the anterolateral part of the connected margin. Straight sinus, along the line of connection between the falx cerebri and the tentorium cerebelli. It’s a small sickle shaped fold of the dura mater in the sagittal plane projecting forwards into the posterior cerebellar notch. It goes from the internal occipital protuberance along the internal occipital crest to the posterior margin of the foramen magnum. It’s a free concave anterior margin and a convexconnected posterior border. Venous sinus enclosed in the falx cerebri: Occipital sinus, together with its posterior connected part. It’s a small circular horizontal fold of the inner layer of the dura mater creating the roof of the hypophyseal fossa. Inner layer: The inner layer of the dura mater is more fibrous and needs very little blood to nourish it. Outer layer: The outer layer of the dura mater is lavishly vascular and gives nourishment to the adjacent bone. In the anterior cranial fossa: by the meningeal branches of the ophthalmic, anterior and posterior ethmoidal arteries and a branch of the middle meningeal artery. In the middle cranial fossa: by the middle and accessory meningeal arteries and by the meningeal branches of the internal carotid and ascending pharyngeal arteries. In the posterior cranial fossa: by the meningeal branches of the vertebral and occipital arteries. Supratentorial dura is supplied by the ophthalmic nerve. Infratentorial dura (dura of the floor) has abundant sensoryinnervation (for this reason quite sensitive to pain). It’s supplied by the following nerves: In the anterior cranial fossa: by the anterior and posterior ethmoidal nerves (and gets some twigs from the maxillary nerve). In the middle cranial fossa: by the meningeal branch of the maxillary nerve (in the anterior part) and the meningeal branch of the mandibular nerve (nervus spinosus) in the posterior part. In the posterior cranial fossa: by the meningeal branches of the vagus and hypoglossal nerves. All these are the C1 and C2 fibres carried by the cranial nerves. The dura mater around the foramen magnum is directly supplied by the C2 and C3 cervical nerves. The meningeal arteries are the main source of blood supply to the bones of the skull. The bones receive very little blood from the vessels of the entire scalp. Because of this, scalping doesn’t generate necrosis of the underlying bone. The skull bones receive blood supply from outside only where they offer connection to muscles, viz. the temporal fossa and the suboccipital region.